BAGHDAD | An alternative vision for Basra hanging on the wall of Iraq's National Investment Commission as conceived by Al Rajhi TRAC. This housing development project has been on hold since April 2012. Meanwhile, protestors in the oil-rich province continue to rail against poor government service delivery, including power outages in the scorching summer heat, lack of clean water, joblessness and underdevelopment. Our latest on the ongoing protests with reporting from our tireless journalists in southern Iraq: https://www.iraqoilreport.com/news/electricity-service-collapses-as-protests-reignite-31785/ . July 27, 2018. BAGHDAD | My investigation about what might have gone wrong in Iraq's ill-fated May 12 election. 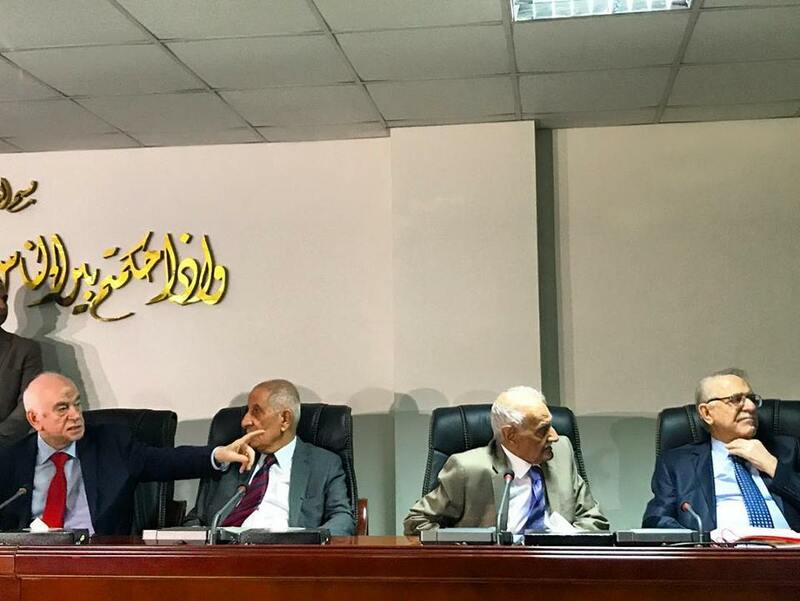 In February and October of 2017 and March and April of 2018, the UN Assistance Mission for Iraq's principle electoral advisor sent letters to Iraq's election commission raising technical and operational concerns about the new vote counting machines acquired from the Korean Miru company for the election. The letters from 2017 outline a rigorous process for selecting and implementing a new voting system - key elements of which IHEC does not appear to have followed. The 2018 letters show the UN's mounting concern that IHEC was lacking the capacity to use its selected technologies and was failing to conduct tests that would help iron out problems ahead of election day. Many of the technical issues raised by the UN were left unaddressed and created major problems on election day. In some cases, legitimate ballots were improperly invalidated; in other cases, the technical problems likely caused accidental miscounts; and IHEC never fully addressed UN concerns about data security. An audit on the software was never conducted. The letters were used as evidence by Parliament's legal committee that ultimately lead to a legislation requiring manual recount, which was largely supported by the Supreme Court. "When I look at the advisory [letters from UNAMI], I see it like a crystal ball," said a senior UN official. July 26, 2018. BAGHDAD | The daily street grind. July 21, 2018. BAGHDAD | Iraq's Supreme Court upholds Parliament directive calling for a manual recount of the May 12 election. Pictured here 4/9 panel of judges. Big questions now: Will ongoing coalition talks be effectively stalled? What is the process by which a manual recount will be conducted? How will parties who have the most to lose react? Never a dull moment. #iraqelections2018. June 21, 2018. BAGHDAD | Al-Rahman Mosque in the Mansour area of Baghdad. It was meant to be one of the largest mosques in Iraq when plans to build were launched in 1998 but interrupted by the US invasion of Iraq in 2003. Still it stands incomplete. May 30, 2018. 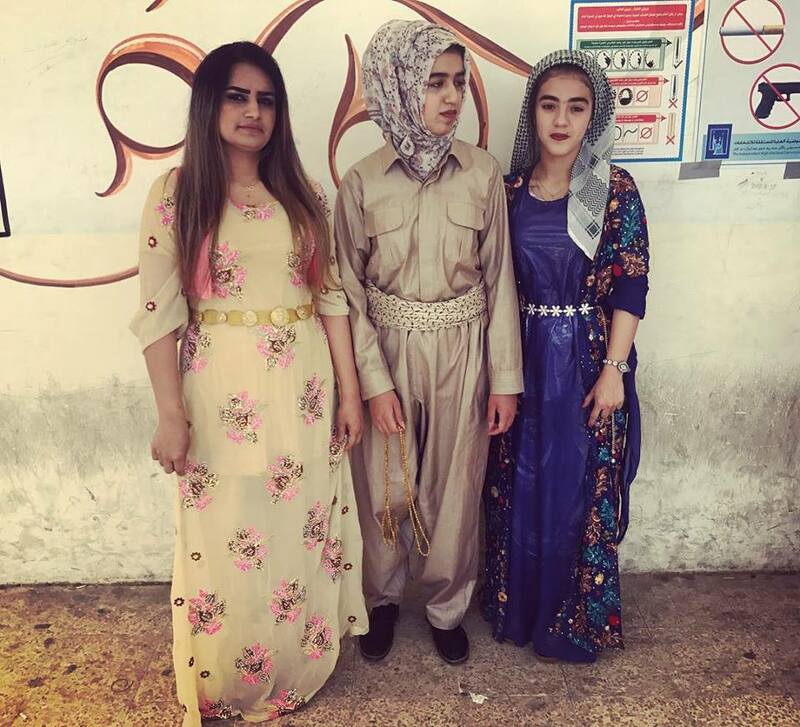 KIRKUK | Fashion forward voters. #iraqelections2018. May 12, 2018. KIRKUK | This couple came first thing in the morning to vote in this Kurdish neighborhood of Kirkuk. "It's important for Kurds right now in Kirkuk. "#iraqelections2018, May 12, 2018. MOSUL | Maj. Gen. Najm al-Jibouri, commander in chief of the Ninevah Operations Command, takes a walk down the souk in the Nabih Younes neighborhood of Mosul. Dozens of residents stop him complaining of destroyed homes, lost relatives, poverty. Most had family members apprehended in the war against ISIS. The General asked his officers to take their names and numbers. May 4, 2018. MOSUL | The ruins of the right bank of Mosul. May 4, 2018. MOSUL | Residents of the old city of Mosul go about their day. Several months have passed since liberation and basic services including electricity and water are still lacking in the right bank of the city. Most of the area was destroyed and residents complain of the slow reconstruction process. May 4, 2018. BAGHDAD | Karim al-Nouri, a senior Badr official now running on Hadi al-Amiri's Fatah list. His office is lined with photos taken from his time on the frontline in the fight against IS. What future do the various political parties with affiliated militias operating under the Hashed al-Shaabi framework envision for themselves? "We took off our military fatigues to become politicians, but if the need arises we keep them in our drawer to be worn again." April 25, 2018. BAGHDAD | A girl skips down the residential street of Karada, in the capital. April 23, 2018. BAGHDAD | Women walk down the street on a dusty day in the capital. April 23, 2018. LALISH | Yazidis while away the afternoon on the hills near the Lalish temple, where many came to mark Charshama Sor ("Red Wednesday"), the celebration of Yazidi New Year which occurs in April. April 18, 2018. 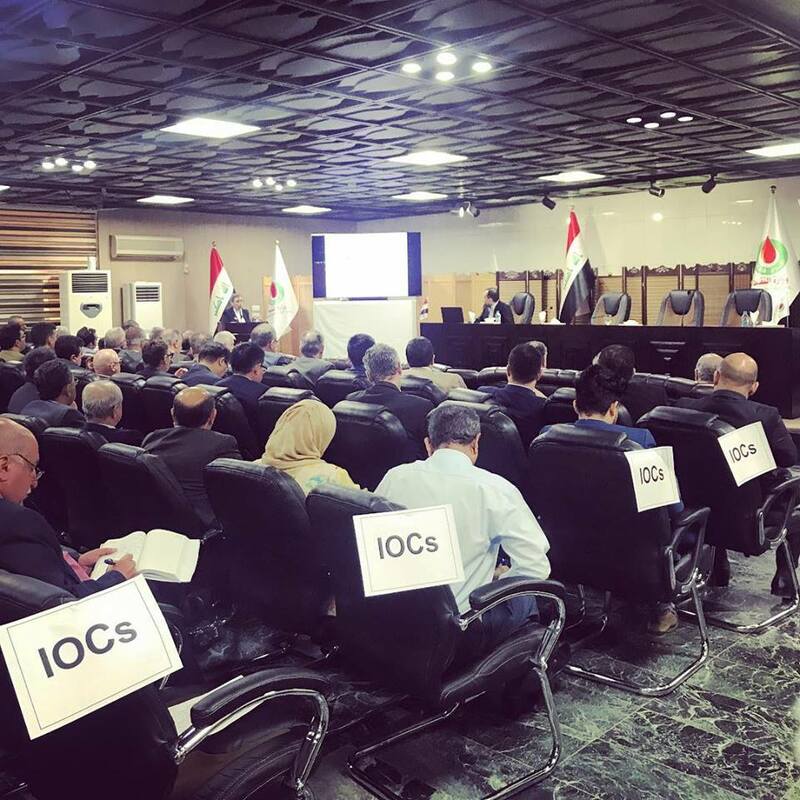 BAGHDAD | A glimpse into the roadshow held by the Oil Ministry for 11 exploration blocks today, in which international oil companies (IOCs) learned the ministry is giving them two days to prepare for an upcoming bidding round in which they are expected to invest billions without having adequate time (usually months) to digest a new contract model that hasn't been finalized yet. The deadline is April 15, let's see what happens. Until then this delightful exchange. IOC: "When will the final contract be provided because you're asking us to prepare in two weeks." Ministry official: "Two days before the meeting." There is laughter, everyone thinks it's a joke. It dawns on the IOC. "Really?" March, 29, 2018. VIENNA | A briefing with Iraq's Oil Minister Jabbar al-Luiebi before the start of the 173rd OPEC meeting. OPEC member countries extended production cuts until the end of 2018. Nov. 30, 2017. NORTH OF ALTON KUPRI | Peshmurga fighter waits near the defensive line just north of the Kirkuk-Erbil checkpoint. A few kilometers south is Alton Kupri/Pirde, the last town in the disputed Kirkuk province held by Kurdish forces and seized by the Iraqi Security Forces Friday evening after fierce battles. Peshmurga have opened a front less than a kilometer north of Alton Kupri to resist further ISF advances into the autonomous Kurdish region according to 2014 borders. Iraqi forces have not given any indication of plans to push north and described Friday's takeover in Alton Kupri as the last in the operation to reclaim Kirkuk province. Peshmurga officials here have said as far as they are concerned this checkpoint marks the border with federally-controlled territory. Oct. 21, 2017. KIKRUK | KDP Peshmurga commander Kemal Kirkuki shows us where Iraqi federal forces have built up military positions southwest of the oil-rich disputed province of Kirkuk. Tensions and mistrust has been building among Iraq's military forces in the aftermath of the KRG's Sept 25 independence referendum. Yesterday, Kurdistan Region Security Council posted on Twitter that it believes federal troops are gearing up for a major attack. Oct. 12, 2017. ERBIL | Landed in Iraqi Kurdistan, just hours after the country's civil aviation authority issued a notice suspending international flights to Erbil and Sulaymaniyah on Sept. 29, acting on a request from Prime Minister Haidar al-Abadi after the Kurdistan Regional Government went ahead with an independence referendum despite opposition from the federal government and neighbouring countries. September 27, 2017. TYRE | Long day in Tyre meeting refugee families struggling to maneuver the complex bureaucracy required to legally register their newborns, knowing that without these important papers their children risk becoming stateless - a designation that would impede them from attending school one day, and if they were ever to return to Syria cause massive problems at the borders. "I worry because there is so much we don't know, will there come a day when I have to prove my son is my son?" said Wazira, mother of M, pictured here. 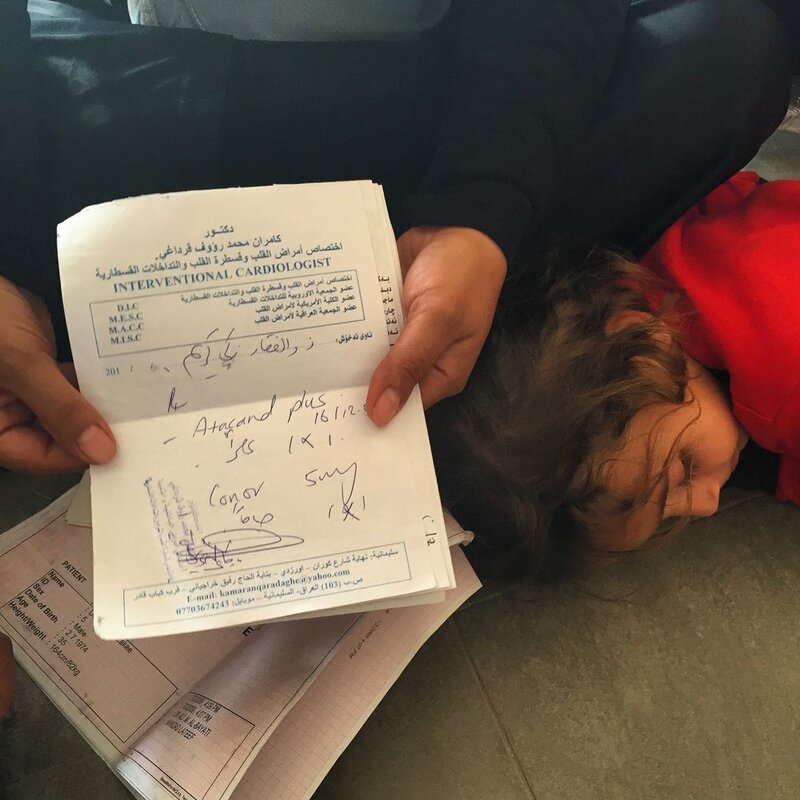 To get births registered Syrian families must, before their child turns one, present a note from the hospital, get a stamp from the mukhtar (locally elected official) and later the nufus (official at governorate level) and then approach the Foreign Registry and Syrian Embassy. Most Syrian parents - monitors estimate only 2 percent of Syrian refugees actually complete the process - stop at the mukhtar level, because they lack the legal papers required to continue. Wazira's Lebanese residency expired years ago and she does not have the means to renew it. For now, M does not possess a single identity document recognized by the state. July 6, 2017. My report about the horrific gas attack in Khan Sheikhoun on the front page of today's The Globe and Mail. Pick it up, read it, talk about what's happening in Syria. April 5, 2017. DUBAI | Piles of boxes with goods as diverse as refrigerators, furniture and good line the wharves in Dubai Creek. Workers from Pakistan, Somalia, Iran and India load the cargo to bring back to their home countries, navigating a path used by traders for a century to get there. Every year 700,000 tons of cargo are transported from here. March 10, 2017. DHAKA | Meeting Rabindra Ghosh, a human rights lawyer defending minority rights. To the right a pile of cases filed by Hindus who have been forcibly evicted from their homes, assaulted and threatened. Bangladesh's minorities - Hindus, Christians, Buddhists - once made up 23 percent of the population, but today that number has fallen to less than 10 percent. March 2, 2017. TEKNAF | A Rohingya girl poses for us in Leda camp, a site for unregistered refugees in Teknaf. Since the October counterinsurgency campaign launched by Myanmar authorities nearly 70,000 Rohingyas have fled to Bangladesh. January 18, 2017. TEKNAF | A Rohingya boy with his siblings in Leda camp, a site for unregistered refugees. They are among the recent arrivals to the camp, fleeing a brutal counterinsurgency campaign in Myanmar. January 19, 2017. TEKNAF | The faint outlines of Myanmar seen from the Naf River in Teknaf, which marks the official border. Thousands of Rohingya have paid boat smugglers to take them the short distance across. Bangladesh border police typically intercept 4000-5000 boats in an average year. January 19, 2017. QAYARA | Oil fields set ablaze by ISIS militants in August still burning in November, continuing to pollute the air with acrid fumes. Efforts to put out the fires have been slow-going by Iraqi authorities. Meanwhile, Qayara's residents continue to live under the toxic clouds. November 3, 2016. QAYARA | The ground in Qayara is marked with sticky oil stains. Thousands of families are living with little access to humanitarian aid. Many complained of breathing problems and doctors said hundreds were being treate for acute lung infections. November 3, 2016. QAYARA | Residents living in Qayara under a cloud of black smoke. ISIS set 19 oil wells on fire in August. November 3, 2016. QAYARA | The town hospital is being refurbished by the Iraqi government with support from the WHO. By November, new medical equipment had been brought in to replace those stolen by ISIS members, who occupied the hospital when they captured the town. A volunteer described how the walls and floors need cleaning every day due to stains from the oil well burning just behind the building. The building was also targeted by coalition airstrikes and is surrounded by debris. November 3, 2016. DEBAGA CAMP | An internally displaced woman from Hawija shows me documents proving her missing husband has a serious cardiac condition. He was taken by the Peshmurga when they crossed the frontline just five days before, she said. "They suspect he is ISIS, but I know him. He is not." Her teenage son is also in a holding facility inside the camp for additional security screening. October 28, 2016. DOHUK | "Land for Sale"
HALIFAX | The Habash family was resettled to Nova Scotia from Lebanon, part of the Liberal government's ambitious plan to take 25,000 Syrian refugees in three months. Following up with them here nine months into resettlement. October 3, 2016. HALIFAX | Taim Habash, 5, looks on as the big kids skate around the park pit. His family was resettled to Canada nine months ago from Lebanon, as part of the Liberal government's ambitious plan to bring 25,000 Syrian refugees to Canada. October 3, 2016. NARSHINGDI | Alia lives the district of Narshingdi, in central Bangladesh. When a cousin encouraged her to work in Lebanon as a domestic worker she jumped at the opportunity. Women in her town have little choice in terms of jobs; most work in garment factories or as house workers for wealthier Bangladeshi families. She was told by the recruitment agent that she could make 60,000 TK (around 760 USD) a fortune compared to local standards. The first two weeks with her Lebanese employers were fine, she recalled. "But then something changed," she said. They took her to a hotel where they said she would find "better work." In fact, they had sold her to a pimp and she was forced to service several men every day. She eventually escaped, found shelter in a safe house and was able to return home. "But there are others, they weren't so lucky," she said. Part of a cross-border project. July 24, 2016. DHAKA | A bride-to-be puts on her gold bangles, the last step in a lengthy process of preparing for her nuptials. July 27, 2016. SHUJAYA | Moussa's entire four-storey home was destroyed during the 2014 Gaza war. He shows us a receipt proving he paid the money acquired from a Kuwaiti reconstruction fund to a cement provider in Gaza, but he says he is still waiting for the delivery to rebuild his home. July 10, 2016. KHAN YOUNIS | Sun sets in Khan Younis as families relax together by the beach. From the far left, the twinkle of Israeli naval boats dot the horizon. July 11, 2016. JAFFA | Boy rides a horse along the beach in the old city of Jaffa. May 27, 2016. NABLUS | The famed al-Aqsa kanafe shop, a family owned institution in the old city of Nablus. I asked what makes the Naboulsi version unlike any other, everyone said it was the fresh spring water used to make the cheese. May 5, 2016. KHIRBET TANA | An improvised settlement in Khirbet Tana, where families settled after their homes were demolished by the Israeli army in February, after an Israeli court order was issued against unauthorized building in the area. This village, which is about one mile inside Area C, is also near a military firing zone. April 22, 2016. KFAR RAI | Two different color flowers grown from the same stem, a gift from Kfar Rai, a small village close to Jenin. April 26, 2016. BEIRUT | Syrian refugees are greeted in Canada's refugee processing centre, a one-stop shop to consolidate paper work and interviews. Canada has agreed to resettle 25,000 Syrian refugees in three months. December 9, 2015. ZAHLE | Five days till departure and the Habash family are still deciding what to pack, and leave behind. They are among thousands of Syrian refugees being resettled to Canada. December 5, 2015. BEIRUT | Tears of joy in Riad al-Solh as families celebrate the release of their loved ones taken hostage by the Nusra Front. The militant organization announced it would release the 16 captive Lebanese servicemen in a prisoner swap. The servicemen were captured in August 2014, when Nusra and ISIS briefly overran the border town of Arsal. December 1, 2015. BURJ AL-BARAJNEH | At the site of a deadly twin suicide bombing that struck the busy Beirut suburb of Burj al-Barajneh leaving 43 dead. It was later claimed by ISIS. November 13, 2015. BISSIRIEH | "Can I take your portrait?" "Yes, and you can take my inheritance and all my riches too." November 13, 2015. ZAHLE | Syrian refugee boys play in Zahle's potato fields. November 2, 2015. 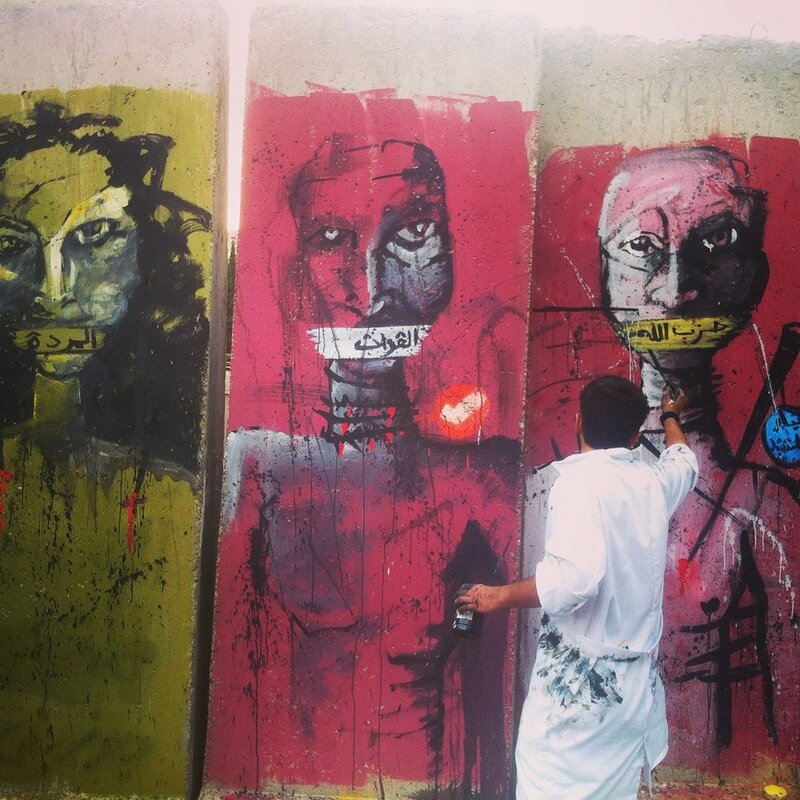 BEIRUT | "You Stink" Protestors paint over cement barriers erected in the Grand Serail by Lebanese security forces. August 25, 2015. ARIDA | Fishermen in this small border town sometimes must dip into Syrian waters to make a good catch and risk fire from two armies in the the process. How as the Syrian war affected them? "From all sides," said fisherman Haitham Darwish. April 29, 2015. SHEBAA | The edge of south Lebanon, Israel to the south and Syria to the east. February 25, 2015. KOURA | Speaking to Salafist Sheikh Salem Rafei about the rise of radicalism and Sunni discontent in Lebanon. February 19, 2015. MINA | Man smokes under an awning during a winter rainstorm in northern Lebanon. February 12, 2015. TRIPOLI | The view from Tripoli's port. Before the Syrian uprising in 2011, nearly 300,000 tons of cargo was docked from Eastern Europe on this harbor, most of this is transferred to Syria and Iraq by truck. Today a few courageous truck drivers still make the perilous journey through war zones and ISIS territory. December 5, 2014. DINNIEH | Eerie quiet over the apartment raided by the Lebanese army in Dinnieh, north Lebanon, where a suspected ISIS sleeper cell was allegedly operating. November 7, 2014. ANI | The ruins of an ancient Armenian metropolis, somewhere between Turkey and Armenia. October 16, 2014. CAIRO | A man walk down from the entrance of Old Cairo. April 23, 2014. QIBBEH | A memorial for a Lebanese ISIS fighter who died in Iraq this week. Two ISIS flags fluttered by the Hamza Mosque roundabout, as dozens of men streamed inside to pay their respects, laughing and hugging one another by the entrance. October, 2014. BEIRUT | Ali shows me his ballot form, which he says was distributed before Syrians could enter polling booths. He was among the mob of hundreds crowding the doors leading to the Syrian Embassy in Yarzeh to vote in the election. May 28, 2014. HALBA | Drawings by Syrian children at a War Child-DRC run center in Akkar. October 11, 2013.